Claire and I were looking to venture into Kent for a weekend, this meant we were able to visit somewhere a bit further away than usual. 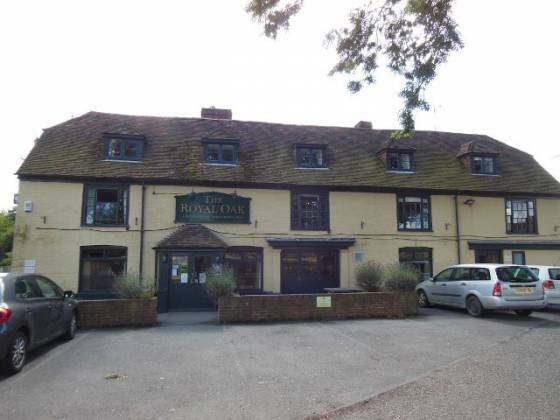 I decided on trying out a Sunday lunch in Romney Marsh, the area where the famous Romney Marsh lamb is breed… I found The Royal Oak online and gave them a call, booking for Sunday lunch. We arrived a bit earlier than our booking, so had a quick wander around the village, Brookland. The Royal Oak part was very quintessentially English Village, with lots of greenery, a school and a church / cemetery. There were a few public footpath walkways, so anyone wanting to walk up an appetite, or work off the lunch / dinner should be happy with this. There was also a couple of horses in an area opposite the pub. Walking through, we were met straight away at the bar area. They were very welcoming, passing us a couple of menus whilst we relaxed with a drink before going to our table. A clean pub affair, with drinks on draught as well. We were shown to our table, with our order taken for lunch – we were in the heart of Romney Marsh Lamb country, so both of us decided we just had to have that! At the bottom of the menu, it state that if you are not having a starter, then please be prepared for a 30 minute wait. With this in mind, I ordered some bread for Claire and me to share. The bread came out quickly – it was a standard, part-baked baguette. Not fantastic, but edible. We polished this off within a couple of minutes. But then, almost straight after eating it, our main courses came out! To be honest, I was a bit annoyed with this – I only bought the bread because of the menu (and I didn’t really want it – it was something to tied us over for half an hour). This meant that we were full up on cheap bread instead of tucking into our expensive Sunday lunch. Rant over. For now. Our plates were quite well stacked, with a Yorkshire pudding sitting on top of the lamb, roast potatoes and carrots. We were then brought a bowl of chard and a bowl of cauliflower cheese(!!!!). I requested some extra gravy, as it did not seem like enough was served. This was promptly brought out in a small jug. We had a few roast potatoes each. Claire really liked her’s, but mine were very burnt on one side, and then not cooked enough on the other. Also, talking about burnt food, the yorkshire pudding was SO burnt on top, as was the top of the cauliflower in the cauliflower cheese! The chard was nice, with both red and green. Also, the carrots hidden under the meat were good. Lastly, the gravy was of high quality, seemingly made from the juices of the lamb. I have turned a bit gluttonous at the moment and the temptation of a Kent dessert was all too much, with layered chocolate pots, hokey pokey ice cream, apple & cinnamon crumble, lavender pannacotta and Eton mess – after some consideration, I settled on an old favourite, the cheesecake. In only a couple of minutes, it was brought it. Looked quite good, with two raspberries on top and some icing around it. 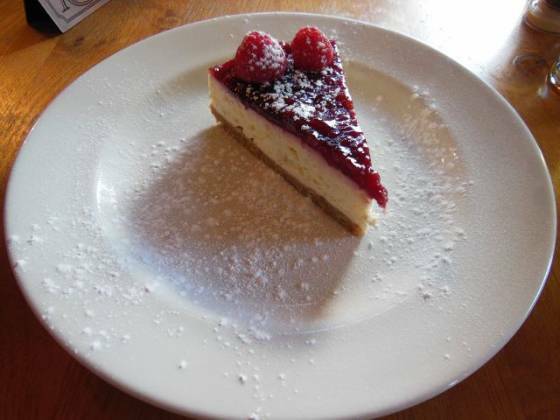 A standard cheesecake, in my opinion, however it was nice enough and I would be happy to order it again. So, on to my conclusion. The review may sound a bit too negative, but I had very high expectations of The Royal Oak. The pricing compared to the rest of the area was high, so in my mind this meant that everything was going to be at the highest quality. The menu gave incorrect information on length of time for food to arrive, the bread was cheap and I am very surprised they felt it was ok to serve extremely burnt food. I must note – Claire’s meal was not burnt at all and she enjoyed all of it (apart from not being able to eat it all because she was full up on “cheap” bread). The venue itself was very clean and looked after. It was also fully booked, so make sure you give them a call before turning up for Sunday lunch. 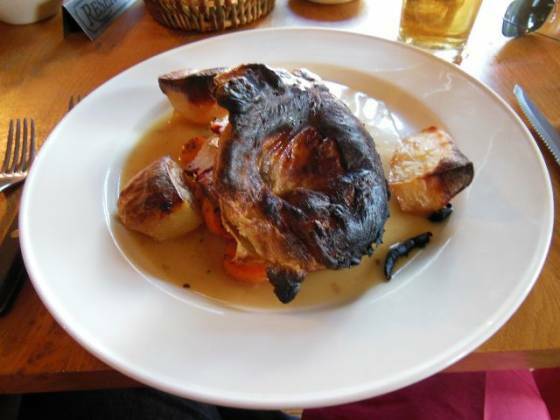 Overall, I am going to award Sunday lunch at The Royal Oak in Romney Marsh a respectable 3.5 plates.